Sean Miller picked up his first commitment for the Class of 2016 on Saturday, receiving an oral pledge from 5-star power forward Lauri Markkanen of Finland during his official visit to the campus in Tucson. 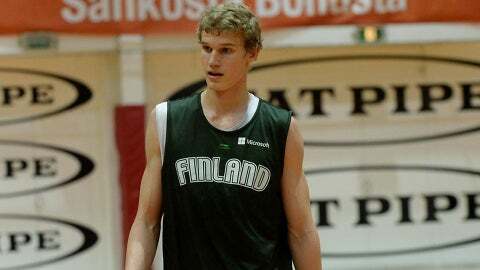 Markkanen, 6-feet-11, had previously visited Utah and North Carolina. He averaged 18.2 points and 6.3 rebound for Finland’s U18 team in the FIBA U18 European Championships this summer. "I think I have a chance to go play against great guys every day in practice," Markkanen told Scout.com. "I think I can get minutes here. I like everything I see here." Many recruiting analysts believe that Markkanen’s game is advanced enough that he could be ready for the NBA Draft after one season at Arizona. He’s considered to be in the "stretch four" mold, with a game that’s similar in style to Dirk Nowitzki. "The amount of progress he’s made in the last year is really impressive," an NBA scout told ESPN. "He’ll get picked whenever he declares."